Dietitian's Picks- Three featured foods that add valuable nutrients to a healthy diet. 3-Day Meal Plan- A simple, easy to follow meal plan to help incorporate the featured foods into your diet. 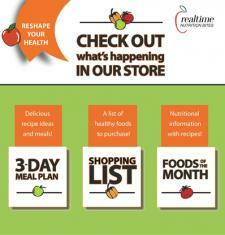 Shopping List- A clear, organized list of what you will need to follow the 3-Day Meal Plan.